Campus Library is chock-full of teacher-contributed educational content including YouTube videos, websites, and district-specific documents. When integrated with the Lightspeed Web Filter, library resources that would ordinarily be filtered are unblocked automatically for users. How do I find items in the Library? Clickable links in the left column let you browse the Campus Library and District Library by subject area and grade level. You can also search by title or keyword either separately–or in addition to subject area and grade level. If you simply type “abc song” into the search box at the top right corner of the page and press [Enter], your results will look something like this. Page through results and click on any tile to see the item page as below. Additional details will display, and you can click the resource image to visit the website or play the video. Campus Library is chock-full of teacher-contributed educational content–and you can add to it too! Naturally, to help everyone steer clear of any legal trouble, there are a few categories of content that simply aren’t allowed. Ever. And that’s why your local administrators are a-okay with you using this method to bypass the filter. Here’s how it works. When a teacher adds a video or website, we run a check against our content filtering database to ensure compliance with the Children’s Internet Protection Act (CIPA). After passing muster, the new addition is issued a URL with special sauce to bypass the Lightspeed Web Filter. So resources that would ordinarily be filtered are unblocked automatically for users with the library-issued URL. Walk through it. 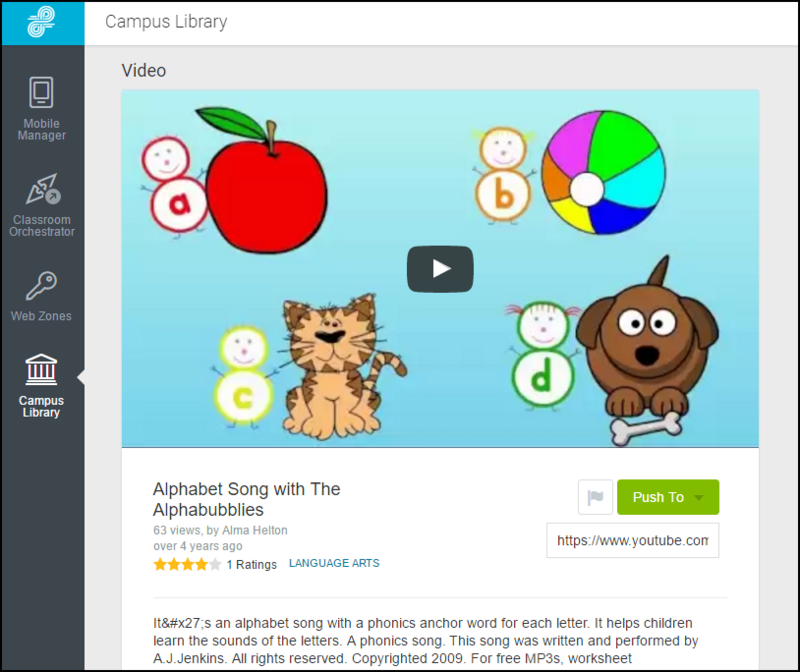 Take the guided walkthrough of Campus Library inside Launch to see how to find, share, and add resources. How do I add something to the Library? 1. Navigate to Campus Library and click the green “+” button at the bottom right corner of the page. 2. Select the type of content: Online or Upload. For online content, copy and paste the link to the item in the Link box, then click Get Info. For Upload items, click Choose Files, then select the item to upload. Maximum size per file to be uploaded is 700MB. 3. 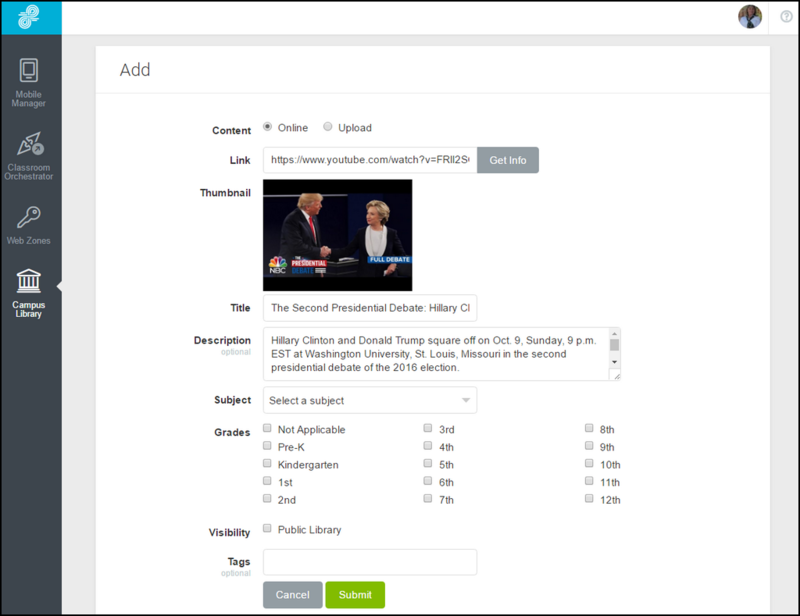 Edit the Title and Description, then select a subject area and grade level. 4. Check (select) Public Library to share the item publicly with all Lightspeed Dashboard users. 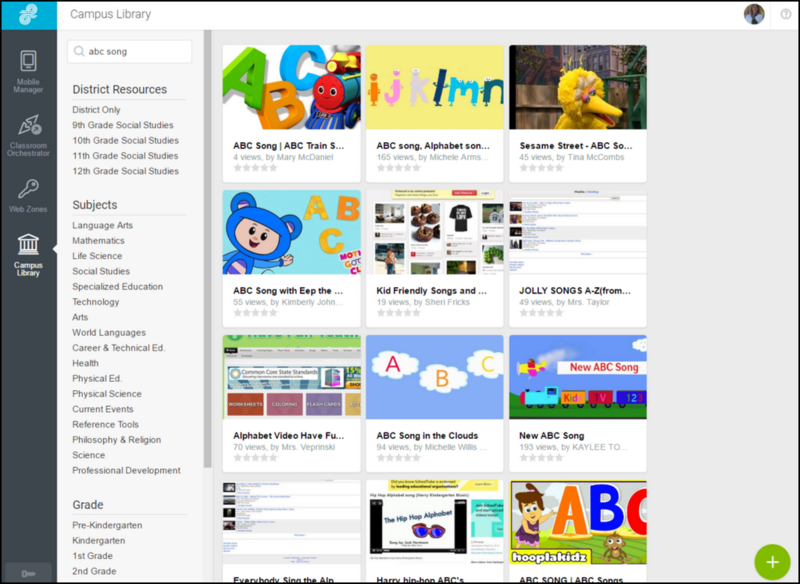 Administrators can select District Resources to share the item with teachers within the district as well as, or instead of the public Campus Library. 5. Add tags (keywords) to make it easier to find your item in the Library. Can I upload licensed or copyright items to the library? If the license terms or copyright permissions allow you to copy and share the content, you can upload it to the Campus Library. If the terms restrict sharing to your school or district only, you can ask an administrator to add it to the District Library. Please do not upload non-public content to the Campus Library that you did not create, unless the copyright and/or license clearly grant permission to share the content with others. The domain googlevideo.com must be allowed by the Rocket for Campus Library videos to play correctly. If you’re having trouble with videos not playing properly, contact your IT department for assistance in allowing this URL. 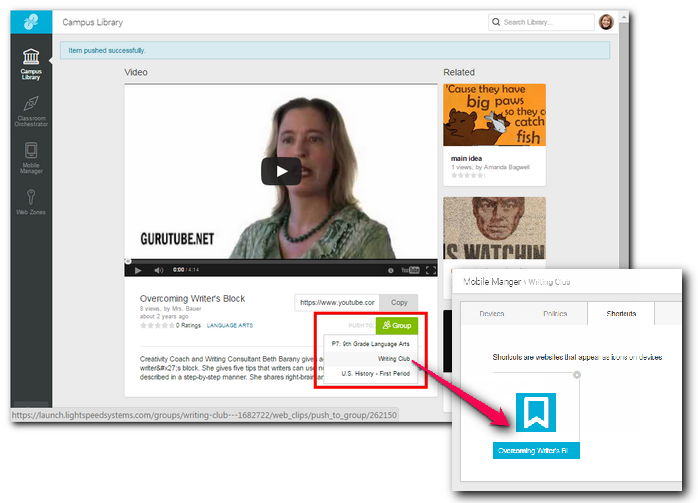 How do I share items from Launch Campus Library? If you want to share this resource with students in a learning management platform, copy the link provided in the item details page to your clipboard. From there, you can paste the link into a anything you normally use to share resources: LMS, class website, Google, Office 365, email, and so on. Student view. 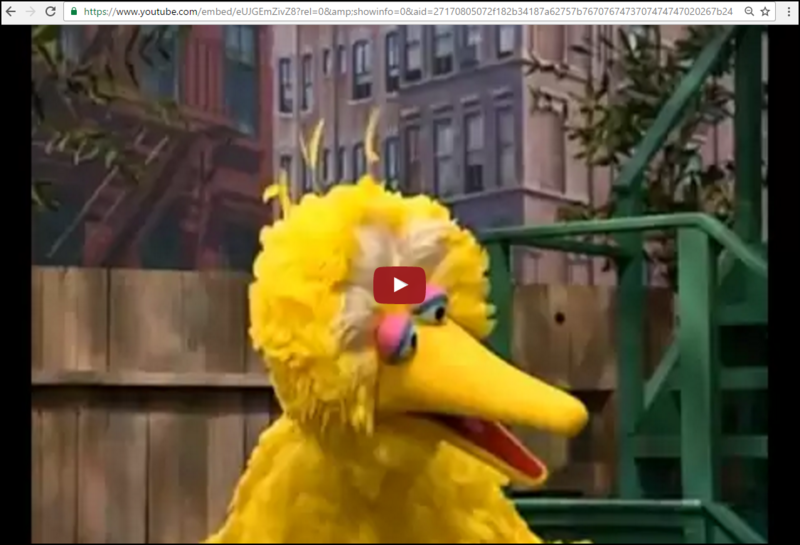 When sharing a link to a YouTube video, here’s what the student sees–nothing but video. No peripheral content, reviews, recommended videos, or comments. Of course, some videos may open with a brief advertisement. Got Mobile Manager? If so, you can quickly push this resource to students’ devices. Click the green Group button to create a Web Shortcut that will appear on student desktops. As the teacher, you’ll see it within Mobile Manager on the group’s Shortcuts list. Campus Library users also have access to the District Resources library — a district-provided collection of resources available exclusively to staff in the district. If you don’t see anything there, it’s likely your administration is not using this part of Campus Library. Only district administrators can add to the District Library. To browse the entire District Library, click District Only in the left sidebar. You can filter by subject area and/or grade level. Pro Tip. See below where Mrs. Richards has District Resources navigation is pre-populated with high school social studies? That’s because she’s selected grade levels and subject areas in her Account information. Click the user icon in the top right of your screen to update your account info. Once that’s saved, the corresponding subject areas will display under District Resources. Click any of the links in the list to see all matching items. To search for items within your District Resource library, click District Only, enter your search terms and press [Enter]. 1. Which should you use if you want to share resources only with your district? 3. True or false: All resources in the Campus Library are CIPA-compliant.